Gordon Campbell, one of Britain’s leading trombone players, is to make a special guest appearance at this year’s Chichester Festival. He will be performing with the Southdowns Concert Band , under the musical direction of Royal Marine Bandmaster Mr Tom Hodge MBE , at St Paul’s Church, Chichester on Wednesday 9th July at 7.30pm. 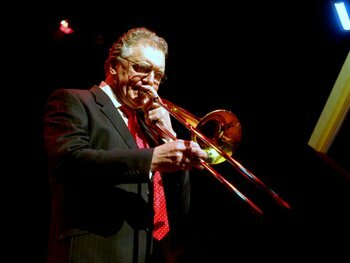 Gordon is trombone professor at the Royal Academy of Music and the Royal Marines School of Music, Portsmouth, and has been lead trombone of the BBC Big Band since 1984. His varied career has brought him into close working contact with many of the world’s leading performers, among them Ella Fitzgerald, Barbra Streisand and Robbie Williams. The concert will feature music from the Big Band Era and from stage and screen, including highlights from ‘Orpheus in the Underworld’, ‘Les Miserables’ and ‘ West Side Story’. Tickets (£10- under 16’s free) are available from Chichester Tickets on (01243) 813595 or online at www.chichestertickets.co.uk.